On 1 April 1928, Dutch engineer Hub van Doorne started a small construction workshop in the city of Eindhoven, the Netherlands. From these humble begin-nings, DAF has evolved into a leading global truck manufacturer focused on inno-vation, quality, and transport efficiency. The highly talented Hub van Doorne opened his small workshop in the corner of the lo-cal Coolen brewery in Eindhoven. Initial work included welding and forging for the city and local companies like lamp and radio manufacturer Philips. The Great Depression inspired Hub van Doorne – together with his brother Wim – to expand services. The workshop evolved into a trailer manufacturing business in 1932 and the company name was changed into Van Doorne’s Aanhangwagen Fabriek (Van Doorne’s semi-trailer fac-tory), abbreviated to DAF. Thanks to their welded chassis, the trailers and semi-trailers that left the small factory, stood out from the competition because of their high pay-loads. The welding – used to make these trailers was a unique innovation in those days that significantly saved weight. Another unique invention was the DAF container trailer which debuted in 1936 and was designed to quickly load and unload containers from a railway carriage. This was a very early example of intermodal transportation and made DAF one of the world’s first suppliers of container trailers. In 1949, the first DAF truck entered production and the company name became Van Doorne’s Automobiel Fabriek. A year later a dedicated truck factory was built and pro-duction started with three, five and six tonne truck chassis and the truck company we know today was on its way. In the early days, DAF installed Hercules and Perkins petrol and diesel engines, but in 1957 the Eindhoven company designed and began manufacturing the first DAF-branded engines. Two years later, DAF improved the DD575 diesel engine by adding a turbo charger which was another ground-breaking achievement. DAF introduced turbo intercooling as an industry-first in 1973. The technology was initially developed to meet the demand for higher engine outputs and lower fuel consumption, but also proved to be indispensable in realizing cleaner exhaust emissions. In the 1980s DAF launched ATi, Advanced Turbo Intercooling which provided further power and efficiency gains through a further refinement of injection technology and an optimised shape of the com-bustion chamber. In 2005, DAF unveiled the PACCAR MX engine that is now installed in all of DAF’s heavy-duty trucks and over 40% of Kenworth and Peterbilt built trucks. The latest gen-eration MX-13 and MX-11 engines feature extremely efficient down speeded engines, intelligent drive lines and efficient rear axles that result in high torque being available at impressively low engine speeds for unmatched fuel efficiency and the highest driver comfort. Together with advanced vehicle software algorithms, excellent aerodynamics and a new compact after-treatment system, these DAF innovations result in a fuel effi-ciency gain of an impressive 7%, the largest fuel efficiency gain in the history of the company. The first DAF trucks from the late 40’s, early 50’s left the plant as just a chassis with in front of the engine the characteristic grille with seven chrome bars and a temporary seat made of wood. The DAF chassis were driven to bodybuilders for the mounting of a cus-tom and locally made cab. In 1951 DAF introduced its own cab, with round corners and a slanted front grill for better aerodynamics. Driver comfort was enhanced by the intro-duction of a suspended seat. In the 1960’s, DAF further enhanced driver comfort with the first cab designed for inter-national transport. The DAF 2600 offered two beds and windows all around for a spa-cious feeling and an optimal view on the road. Power brakes and power steering eased the demanding job of the driver. The 2600 is now considered to be the first of all inter-national transport trucks. In 1969, DAF was one of the earliest manufacturers to intro-duce a tilting mechanism for the cab-over engine model which greatly improved mainte-nance access. With the introduction of the Space Cab concept in 1988 DAF enhanced its leadership position as a truck manufacturer with its full focus on both operating costs and the driv-er. With the remarkable Space Cab concept, DAF again set new standards in cab size and comfort for international transport. Together with the even larger Super SpaceCab which was introduced in 1994 DAF cabs continue to be the benchmark when it comes to driver comfort and roominess. In 1996, DAF became a PACCAR company. Since then, DAF has continued its leader-ship position as a global technology leader with major developments in trucks, engines, and state-of-the-art facilities. DAF launched the new LF, CF and XF series in 2001 and 2002, the award-winning XF105 model in 2005, and the Euro 4 and 5 program in 2006. A full range of new, ultra-clean Euro 6 models entered production in 2013. And in 2017, the New CF and New XF were named ‘International Truck of the Year 2018’ for their class-leading transport efficiency and impressive fuel efficiency gain of 7%. Also in 2017, In the United Kingdom, the New LF was awarded ‘Commercial Fleet Truck of the Year’. In 2015, DAF demonstrated truck platooning. The EcoTwin vehicle system enabled trail-ing vehicles to automatically follow the lead truck resulting in lower fuel consumption, reduced CO2-emissions and improved traffic flow. Due to EcoTwin’s success, DAF was selected to exclusively participate in English platooning trials in 2017. DAF is engaged with leading European technology development projects to gain comprehensive experi-ence with alternative electric and hybrid power trains. DAF is driving business globally in the 21st century. Its class-leading trucks are manu-factured in the Netherlands, Belgium, the United Kingdom and Brazil, and DAF products are sold by 1,100 independent dealers on five continents. DAF trucks are backed by industry leading services provided by PACCAR Parts and PACCAR Financial. Fleets are supported by Europe’s best roadside assistance, Inter-national Truck Service (ITS) and DAF Connect, DAF’s advanced fleet-management system. DAF’s New CF and XF ranges have been jointly crowned International Truck of the Year 2018 at the Solutrans Commercial Vehicle Show in Lyon, France. With a winning score of 104 votes, the trucks beat the Iveco Stralis NP 460 (96 votes) and the Scania XT (59 votes) into second and third places. The jury of 23 commercial vehicle editors and senior journalists from across Europe praised the trucks’ improved drivelines, which feature optimised MX-11 and MX-13 engines, the latest ZF TraXon 12-speed automated gearbox and new DAF rear axles. These together deliver improved driveability, greater fuel efficiency and seamless gear-changing characteristics. Numerous energy-efficient features include improved combustion, engine down-speeding, intelligent auxiliaries, driveline component integration, enhanced predictive features and weight reductions. “There’s certainly a lot more to this truck than a new sun visor and grille,” said CM editor and UK jury member Will Shiers. The Iveco Daily Blue Power was named International Van of the Year 2018, with the manufacturer praised for producing a range of highly sustainable light commercials with a choice of powertrains that reduce operators’ environmental impact. The range, which includes electric, CNG and Euro-6 Real Driving Emissions options, scored 113 votes, with the new Ford Transit Custom coming in second place with 79 votes. The other podium place went to Volkswagen Commercial Vehicles’ latest gas-powered Caddy TGI model. “The Daily Blue Power range puts together the main and viable solutions to reduce the environmental impact of LCVs in urban and suburban operations,” said one of the judges. In the final category, the Volkswagen Amarok V6 took the International Pick-up Award 2018. “Jury members adjudged the Amarok V6 to be the best all-rounder in a very close-run competition. It scored 56 points with its new German rival, the Mercedes-Benz X-Class achieving 50 marks, and the current Toyota Hilux not too far behind on 41 points,” said Jarlath Sweeney, chairman of the International Pick-up jury. Inland Truck Centres Wagga Wagga has been named the Paccar Dealer of the Month for March 2018! Congratulations to all of the team at Wagga. Click the photo below for the full story! Andrew is currently completing the first year of his Heavy Vehicle Mechanical Apprenticeship. He has been described by his host employer as being keen and committed to his trade and always willing to help out. Andrew has an enthusiastic attitude to his apprenticeship which has achieved results of 97% in theory test completed as part of his Kenworth Dealer Service training. Congratulations to Jack Finlayson of Inland Truck Centres Dubbo, finalist in the PACCAR Australia Technician of the Year 2013 (Kenworth division)! Throughout 2012, a series of four tests were sent out across the Dealer Network requiring technicians to answer a variety of questions relating to the DAF and Kenworth product. 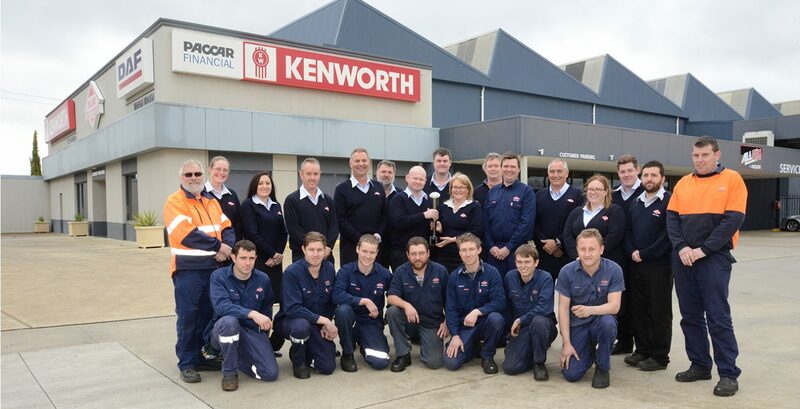 Based on these results, the top six finalists were selected to take on the Service Challenge competition at PACCAR Trucks Melbourne workshop in Derrimut, Victoria. The competition was comprised of two parts – theory and practical. The Theory Challenge was based on a classroom examination of the competitors’ technical knowledge. Competitors were given access to DealerNet and required to solve a series of technical problems. The Practical Challenge pitted three technicians against each other in two separate categories, Kenworth and DAF. Three identical Kenworth K200’s and three identical DAF CF85’s were configured with simulated ‘faults’ added by PACCAR Australia’s Customer Service Department. The challenge was to find all faults, apply appropriate methods to fix them, write up comprehensive job cards and leave the vehicles in the same condition as if they were being handed back to a customer – all in the quickest timeframe possible. Congratulations to Steve Fields and Transforce Bulk Haulage! They're the first Australian heavy transport company to be certified Carbon Neutral! Truckie Steve Fieldus is taking his carbon neutral commitment on the road with a newly branded B-Double, one of a fleet of eleven at his company Transforce Bulk Haulage. His newly branded truck is the first in Australia to carry the distinctive green and white certification Carbon Neutral trademark (logo). Transforce Bulk Haulage is the first heavy transporter in Australia to be certified Carbon Neutral, making Steve a true environmental leader, showing the way for the future of trucking in the low carbon economy. Mr Fieldus was today formally presented with Carbon Neutral Certification at the Carbon Farmers Conference in Dubbo, by The Honourable Mark Dreyfus QC MP, Parliamentary Secretary for Climate Change.